We are proud to be supporting P/Hop for a second year. 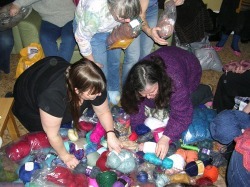 Last year the yarn swap and exchange was a raucous event with a sea of yarn, needles, books and magazines covering the floor of the Lounge. Participants came away with armfulls of goodies and gave their donations to P/Hop as soon as they got back home and got online. In 2010 we are hoping for similar scenes! The exchange will take place on Friday night in the Lounge, space permitting. To take part you just need to bring any knitting or spinning related goodies that you are not going to use. Maybe you bought something online and when it arrived the colour wasn't quite suitable? Maybe you bought it at a show on a whim and have just never found a use for it? Whatever the reason, there is bound to be someone else who wants it! So bring along your goodies and expect to be taking away someone else's by the end of the evening!